Let’s get your steps and other activities recorded so that we know how many calories you are burning. Next up, with the help of a free app, you will start logging your food, giving you a clearer picture of your calorie intake. Your real-time, calorie balance calculation, will allow you to make informed decisions about food and exercise. Finally you will share your assessment data with our resident LifehackrDiet coach. That requires downloading of a final free app, which will share your data with our coach and allow two way messaging communications. You can ask questions and get advice from your coach during the assessment period. Finally after approximately 10 to 14 days, your coach will make your final assessment, taking into account all your data. The LifehackrDiet Flow chart is the basis of the approach you are going to be taking while you are on the LifehackrDiet. It’s a simple, empirical approach which gives you tools to help you reach your weight-loss and wellness goals. So much about eating, body image and weight is tied to deep emotions and self-identity. These tools will help you separate from those strong bounds and let you see the issues for what they are; habits you can change, one small change at a time. A digital pedometer enables you to quantify the calories you burn by moving during the day. Today’s technology gives us realtime, always on, wireless devices that automatically synchronize (via Bluetooth technology) with your smartphone and installed apps. All you have to do is remember to attach the pedometer to your self in the morning, the rest is automated. Now that we have a clear idea of how much we are moving and how many calories we burn in a day, we need to start figuring out how many calories we consume. To do that, use a food diary to record what and how much you eat in your day. A body weight scale works as a validator of the (calories out – calories in) sum. If the amount of calories you burn in a day/week/month is greater than the calories you’ve consumed, you will lose weight. The body weight scale will validate this. When you know how many calories you are burning, consuming, and the resulting weight change, you can make informed choices about your food and exercise in order to move yourself towards your goals. Your pedometer, food diary, weight scale and smartphone software can calculate where your are at any given moment, but it is ultimately up to you to make the decisions which will move you forward towards your health goals. LifehackrDiet helps you set up this system and also shows you ways in which you can make small changes to your lifestyle that will bring permanent change. It’s up to you, and no one else, to make all of this happen. Using your Fitbit Digital Pedometer to record each and every footstep you take. Step 1. You are recoding every morsel of food that passes your lips in the Fitbit app food diary Step 2. Recoding your sleep, weight, body fat percentage and water intake. Step 2. You are simply recording what you normally do, so that you create a baseline of data. It’s time to start sharing your data your LifehackrDiet coach. Nudge app will open a secure (HIPPA compliant) chat stream with your LifehackrDiet Coach and give you the power to “revoke” access whenever you wish. Nudge app will become the “curator” of your data. For many people, all the numbers and charts that litter apps like Fitbit and MyFitnessPal, can be overwhelming and turn them off of the whole “Quantified Self” approach. This app will quiet down all the noise and give you all the info you need to move forward, in one graphic! FYI, you can revoke Nudge app’s access to your data at any time and delete the app with no impact on your Fitbit data. Once you’ve downloaded the Nudge App for your smartphone, run it and click on the “Apps” button bottom center (see fig. 1 above). You will be presented with several synchronization choices. For this assessment we are going to use Fitbit (if you already own a Jawbone UP, you can sync that app to Nudge.) You will then be presented a screen which requests that you give Fitbit permission to share it’s data with Nudge (see fig. 2 above), please select the “Allow” button to continue. 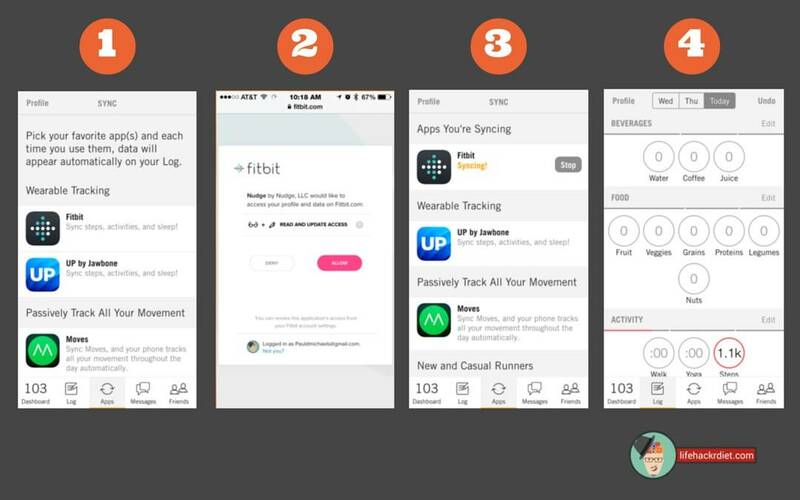 You will then be returned to the Apps Syncing page (see fig.3 above) where you will see that you can “stop” Nudge app from syncing with Fitbit at any time. To confirm that the two apps are connected, tap the Log icon and scroll until you see the “Activity” row. If your Fitbit has recorded any steps today, they should show up in the “Steps” circle, in an abbreviated format. At the top of the Nudge app screen you will see that you can view and edit the past three days of data, so you can also browse through those days and see that your steps have been synced from Fitbit. If you purchased a Fitbit that records your sleep, and you have used that functionality, you will see your sleep duration show up in the “Sleep” row. Now, you can see that by capturing your data in Fitbit, you can share that information with other apps and gain whatever benefits that specific app has to offer – record once, use many times. I love it! To connect with your LifehackrDiet Coach, tap on the “Dashboard” icon (bottom far left) of the Nudge app. You will see the main Nudge Factor screen which is the core of the this app and a brilliantly simple way to see all your data, but more on that later. At the top left of the screen (see fig. 9 below) tap on the “Profile” button and you will find yourself on the Profile screen where you will see and be able to change all your personal information. To connect with your coach, tap on the “Enter a Promo Code” button. Once the Promotional Code screen has opened, you can now enter the promotional code that was sent to you in your “Welcome” email. Press “Submit” and you should now have a heading “My Nudge Coaches” with the name of your coach and an image to the left of their name. You will also see to the right of you coach’s name a “Revoke” button. This allows you to disconnect from your coach and erase your information from their computer, should you want to. If you tap on the “Messages” icon at the bottom right of the Nudge app, you will be presented with a screen (see fig. 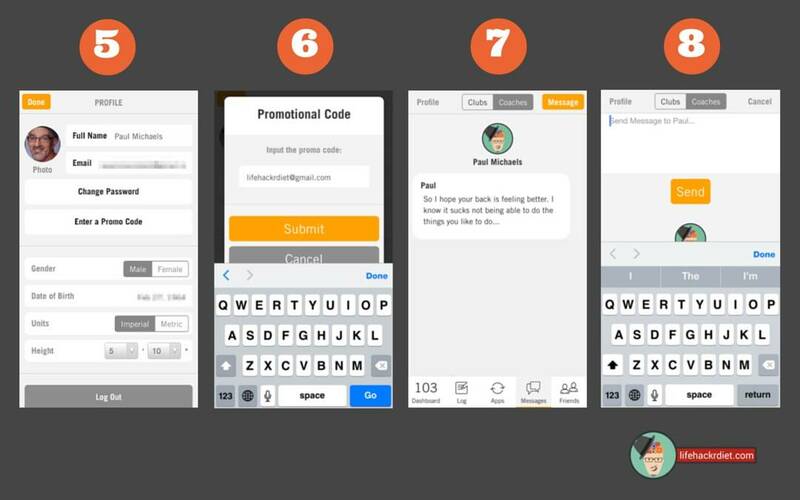 7 & 8 above) where you can chat with your coach, much like you do with your family and friends on your favorite messaging app. Send your coach a message, they are looking forward to hearing from you! Nudge is one of the simplest and smartest health apps I have seen. It serves as visual guide for what you need to try and achieve in the day ahead of you (a quick glance in the morning) and as a review of how well you acted on those intentions in retrospect (inputting your data into the app, before bed). Your Nudge Factor is a single graphic that shows you everything you need to know, in order to keep moving towards your health and weight-loss goals, for that day (see fig. 9, above). The number in the center of the circle represents an accumulated number representative of your statistics over the past 30 days. If you tap on the number you will see a graph (see fig. 13, and red arrow, below), of the statistics Nudge is following over time (see fig. 14 below). Tapping on the “Info” button at the top of the screen will take you to a screen that outlines what the Nudge Factor is based on and the terms for each of the levels you can achieve. Tapping on the quadrants of the circle (see fig. 13, blue arrow, below) you will see an explanation of how Nudge measures each of those categories of statistics (see fig. 16, below). Some of the data that Nudge captures and uses in it’s calculations for your Nudge Factor are automatically passed from the Fitbit app. Those stats are; Activity, Weight (the coach does not see your weight) and Sleep duration. In the evening, you can review your day and in your mind, see how well you executed based on the intentions you set in the morning. Then you can very simply tap on the circular input buttons in the “Log” screen of the Nudge app (see figs. 10, 11 & 12, above) to record your beverages, food, actives, sleep, indulgences, energy level and weight. Tip: For those of you that might not have a Fitbit (or other) digital pedometer that automatically records your sleep duration, you can input it manually in the Nudge app “log” screen and gain the benefits of tracking your sleep. To give you an idea (because this even came as a shock to me!) of portion sizes to use for your Nudge data recording, I have included three graphics (above) that are featured in the Nudge Blog article 3 Unbeatable Serving Size Guides. These are worth bookmarking, or even better, downloading to your smartphone photo app so that you can blow other people’s minds as well as your own! You can grab the full resolution images from the Nudge blog article listed above. Those portion sizes look incredibly small (especially for North Americans) but I can assure you that after following the LifehackrDiet for several months, you will have reset your brain and your stomach and these portions will actually satisfy your appetite. Wake up, go to the bathroom, then stand on your body weight scale. Remember your weight and body fat numbers long enough to record them in the Fitbit App. Remember to put your Fitbit unit on your body, somewhere. At some point in your early morning, launch the Nudge app and check your Nudge Factor (score number and circle quadrants (water, food, sleep and activity). Figure out what you are going to work on today (a single item or multiple items). As you prepare for bed, log any remaining snacks, activities or other information, into the Fitbit app. Launch the Nudge app and go to the log screen and quickly add your water, food groups, indulgences, any activities/sleep not automatically recorded, and finally your energy level. Don’t make any changes to your lifestyle. We are recording a base line of data to work from. If you have any questions or need some advice, please contact your coach through the chat feature within the Nudge app, we are here to help! After the assessment period is over, you and your coach will have a detailed conversation about your data, lifestyle and ways in which you can make small changes that yield huge results. This is the basis for your routine while you are practicing the LifehackrDiet. If you have any questions, issues you are unsure about or information discussed in these three steps of the LifehackrDiet Lifestyle Assessment, please do not hesitate to contact your coach, either through the Contact Us link or through the chat feature of the Nudge app. We want your assessment to be a positive, fun experience that will show you the way to make great (small) changes to your life. An overview of why your are going to use the Nudge app. How to setup the Nudge app so that it automatically grabs data from your Fitbit app. How to connect with your LifehackrDiet Coach through the Nudge app. How to use the Nudge app on a daily basis, and why it is so simply awesome. I explained the Nudge Factor and food Portion Sizes. Finally, I outlined your daily routine on the LifehackrDiet and explained that it should take you less than 5 minutes a day to complete. That concludes the LifehackrDiet Lifestyle Assessment, Step 3.
Review LifehackrDiet Lifestyle Assessment, Step 1.
Review LifehackrDiet Lifestyle Assessment, Step 2.